After spending 22 years as a CNC machinist in the Indianapolis area, Richie Price, in 2015, launched his own business…“backwards,” he says, half-jokingly. 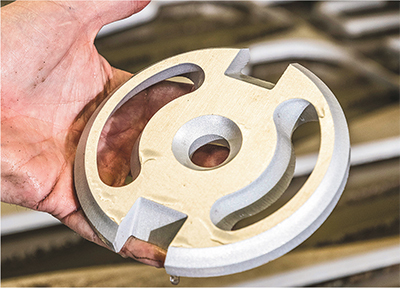 Instead of adding waterjet capabilities after starting with mills, lathes and other conventional machining processes, Price’s carefully researched business plan called for launching RPM Design in Brownsburg, IN, with a single waterjet-cutting system. 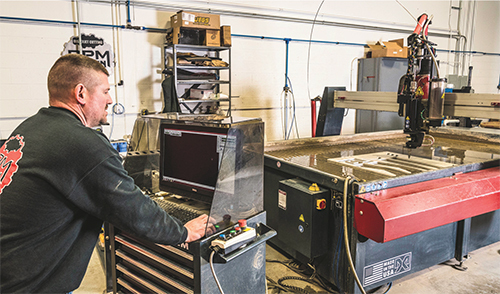 RPM Design’s Richie Price runs a waterjet cutter that enables his shop to successfully specialize in waterjet-cutting services for fabricators. 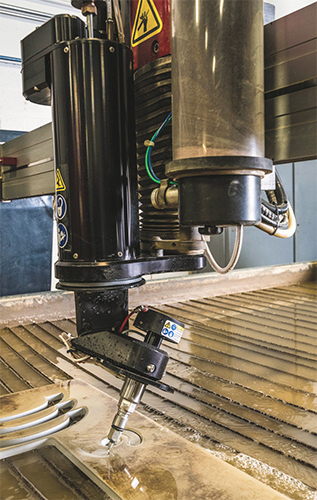 A bridge-type machine with a 10 by 5-ft. X-Y-axis cutting area, RPM Design’s new waterjet-cutting machine features a multiaxis cutting head and programmable Z axis with 12 in. of travel to handle workpieces in stacks to nearly 1 ft. thick. Most of Price’s previous experience came from work that included designing and programming five-axis machines to produce complex contours in components such as high-performance vehicle cylinder heads. Customers included Indy and NASCAR teams, as well as top NHRA drag racers. Price had previous experience with waterjet machining and quickly recognized the technology’s versatility and capability. 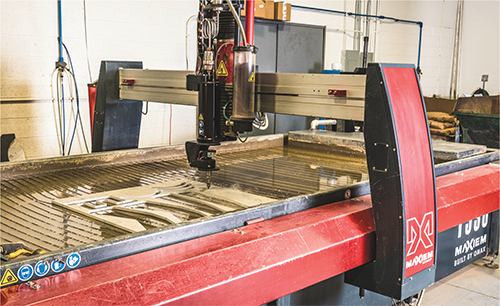 While exploring the prospects for a dedicated waterjet job shop, Price talked with his colleagues in manufacturing and racing to secure waterjet work while consulting with manufacturers of waterjet machines. Ultimately he purchased a Maxiem 1530 JetMachining Center from Omax Corp., Kent, WA. The machine features a bridge-type linear-motion system with a 10 by 5-ft. X-Y-axis cutting area and a software-controlled A-Jet multiaxis cutting head. The machine’s programmable motorized Z axis, with 12 in. of travel, permits machining of single sheets or stacks of workpieces to nearly 1 ft. thick. Linear encoders provide 1-micron-resolution feedback to the motor-control system. While Price initially began with customers in the racing industry, word of mouth in the Indianapolis manufacturing community caused a sharp rise in RPM’s business. “We primarily cut components of bigger assemblies for material handling, medical, automotive, aerospace and heavy equipment,” explains Price, “as well as for racing.” He also offers manufacturing consulting for prospective customers who may not know if waterjet is the best method to make their parts. Shown here, one of the complex parts RPM Design produces on its waterjet-cutting machine. In addition, Price says that multiple layers of different materials do not faze a waterjet. For example, RPM Design cuts multilayered steel head gaskets consisting of two or more thin layers of steel sandwiched with sealing material to form a highly pressure-resistant seal for extreme-pressure applications. In fact, the tooling cost for waterjets, according to Price, is about the same regardless of the material being cut. To further ease the waterjet-cutting process and increase productivity, Omax offers a selection of options. For RPM Design, that meant adding an A-Jet multiaxis cutting head to its Maxiem. The head provides 0 to 60-deg.-angle cutting range and facilitates the machining of beveled edges, angled sides and countersinks. Intelli-Max Software from Omax even enables the A-Jet head to compensate for the natural taper of a waterjet stream, allowing for creation of complex 3D shapes. A multiaxis cutting head allows RPM Design to cut angles ranging from 0 to 60 deg. as well as create beveled edges, angled sides and countersinks. The A-Jet head offers high positioning accuracy, reportedly resulting in cut parts that require no secondary finishing, thus reducing part-production time. “I selected the A-Jet to cut angles as well as for taper control,” Price says. The head, calibrated within 0.0015 in., allows him to cut complex parts such as vehicle exhaust header flanges. Generally, the RPM Design shop schedule is booked for a week or a week-and-a-half in advance. “Depending on the run time of a job and the scheduling, jobs usually are completed in a day,” Price says. He notes that he may complete 10 or 15 jobs per day, with some jobs consisting of 10 to 20 pieces, while others can range from 1500 to 3000 pieces. Currently, 30 to 35 percent of RPM’s work is repeat business, with the number of new customers increasing. As a one-man shop, balancing the shop’s work schedule is Price’s biggest challenge. “Managing work flow is the same as in any job-shop situation,” he says. “You get a job one day with a 4- or 5-hr. cycle time, then you get a job the next day with five different materials and you’re running different piece parts.” On days with longer runs, he does programming, invoicing and prep work. The accuracy and reliability of the Maxiem machine, says Price, enables continuous, uninterrupted operation, “I put a 4 by 8-ft. or 5 by 10-ft. piece of material in the machine in the morning and let it cut all day,” he says. Article submitted by Omax Corp., Kent, WA; www.omax.com.